When you go to the grocery store, you probably take it for granted that the items you purchase will be scanned by a cashier or that you’ll scan the barcodes on the products yourself at a self-checkout. When you go to a clothing retailer, you probably expect to checkout in a similar manner, with a helpful employee scanning the barcodes on the tags attached to the attire you’re buying and then processing your payment. While you may be conditioned to expect barcodes to be a part of your daily retail experience, they have a greater impact on your everyday life than you may realize. Shipping companies such as FedEx and UPS use barcodes to track the packages they deliver, for example. In fact, barcodes are what enable you to track the status and whereabouts of the shipments you’re expecting in real time. At least in theory, the barcode on a bottle of water lying on the side of the road can even identify the person who purchased the beverage if the individual paid for the drink with a debit or credit card. It’s easy to see how barcodes make life easier for individual consumers, but barcodes can have an even bigger impact in the business world. This is especially true in industries that require a business to maintain a large inventory of products. Barcode use in warehouses can increase warehouse production in various ways, for instance. Using a barcode system can reduce warehouse costs and improve inventory efficiency. Using this technology can also minimize warehouse errors. Warehouses that use a barcode system for inventory control typically maintain a 99% accuracy rate. Even people who’ve inputted data for years tend to make at least one error per 300 keystrokes. By comparison, a barcode system yields just one error for every 3,000,000 characters while lasers produce only one misread every 70 million entries. It’s clear to see that inputting information manually not only takes more time than simply scanning a barcode, but it also leads to more mistakes, which take even more time and money to resolve. To fully appreciate how barcodes and scanners can improve warehouse workflow efficiency, you should consider how this technology has evolved over time. It’s equally necessary to identify each of the ways that implementing a barcode system in your facility will increase productivity at your warehouse. Finally, you need to think about the company you want to work with to install and maintain your warehouse’s barcode system. In 1932, a graduate student wrote a thesis that described a new way for consumers to shop for groceries. In his paper, Wallace Flint suggested that punch cards could be used by customers to identify the products they wanted to buy. Once completed, consumers would place their cards in a reader and the selected food items would be delivered to them at the checkout station by conveyor belts. The system also provided a record of the items that were purchased for the store’s management team. With America in the midst of the Great Depression and the equipment at the time being cost-prohibitive, Flint’s idea was as impractical as it was innovative. The next attempt to automate grocery purchases began in 1948. In that year, Bernard Silver overheard a food chain executive asking a dean at the Drexel Institute of Technology to research the possibility of automatically collecting purchasing information at checkout. While the dean turned down the emphatic request, Silver mentioned the concept to Norman Woodland, a Drexel graduate student and instructor. In 1952, the same year their patent was granted, Woodland and Silver worked together to create the first barcode scanner. While their efforts were successful, the technology needed to record the information gathered by a barcode scanner either didn’t exist or was too primitive to process the amount of information a barcode scanner could provide. Even though Woodland and Silver created the first barcode and barcode scanner to address the needs of food retailers, the first industry to adopt a barcode system was the railroad industry. David Collins, an employee of Sylvania Corporation, recognized that the railroad industry needed a way to identify freight cars based on his previous experience working for Pennsylvania Railroad. To satisfy this need, Collins created a coding system for individual freight cars. In 1967, the railroad industry adopted a nationwide coding system for all of its freight cars. While the development and implementation of barcodes and barcode scanners were born from the grocery industry’s need for information, the technology can be found in just about every conceivable industry today. As more and more products included barcodes in their packaging designs over the years, the use of barcode scanners has yielded an increasingly larger number of benefits to businesses throughout the world. Barcodes originally helped grocery stores save money because cashiers could process purchases faster. Barcode scanners still help workers perform tasks faster, but the information they collect helps warehouses save money in many other ways as well. Increase Warehouse Productivity: Since barcode scanners enable employees to process a greater number of orders faster than they could without them, they can increase your staff’s productivity by freeing up time for them to perform other tasks or fill more orders. Reduce Labor Costs: By using barcodes and barcode scanners in your warehouse, you eliminate the need to have an employee on your payroll who is responsible for manually inputting orders. You also virtually eliminate the incidence of human error in the processing of orders because scanners record and transfer information more accurately than humans are capable of doing. Improve Warehouse Workflow Efficiency: Barcode scanners provide information in real time, which means you don’t have to wait for an order to be picked to know whether or not an employee is pulling the right products off of the shelves. If someone picks the wrong product or quantity of items, you can take immediate corrective action to ensure the proper order is shipped. Your barcode scanning system will set a course your employees should follow to fulfill orders. By following the prescribed course, your employees will reduce the time they spend traveling around your warehouse. This not only makes for a safer workplace, but it also means employees can fulfill more orders per shift as well. Improve Inventory Efficiency: Using a barcode system can help you handle your inventory more efficiently, too. Since you get information in real time, you’ll know the exact products you have in your facility and how much of each of them is on hand. Over time, this knowledge will help you keep the minimum amount of product necessary to satisfy your clients without tying up money in items that don’t move. With a fewer number of items in your warehouse, you’ll also reduce the number of products that suffer damage or simply become obsolete due to changing consumer demands. Because they have the potential to save a warehouse so much money, barcode systems generally pay for themselves in six – 18 months. While the cost reductions these systems provide will help improve your facility’s bottom line, barcode systems provide additional conveniences, which can lead to even more savings for your warehouse. Processing Payroll: A barcode system can help with your payroll because it can track the hours each of your employees works. Every employee will have an identification tag with a unique barcode. Your employees simply scan their codes whenever they start or end a shift or take a break. At the end of a pay period, you can send this information directly to your payroll processor without having to do additional paperwork. Tracking Employee Performance: A barcode system will help you keep track of your employees’ performance because you’ll know how quickly and accurately they’re fulfilling orders and who did what task. Tracking their performance may help you identify areas of your operation that can be improved or streamlined to minimize warehouse errors and/or increase efficiency. Tracking your employees’ performance in real time can also help you improve how you schedule your employees, which may increase warehouse productivity even more. Avoiding Outages: Since a barcode system enables you to keep an exact count of your inventory, it can help you avoid being out of the products you sell most frequently. If you receive a delivery, you can consult your system and identify the products you’re running low on immediately. You can prevent a stoppage of workflow by having those items replenished on your shelves first. Invoicing: A barcode system can automatically generate invoices for you. 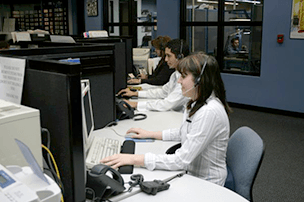 This convenient feature will minimize warehouse errors in the billing department. Managing Material Costs: Since your employees will know the size of the total order they’re preparing to ship when they use their handheld barcode scanners, they’ll be better able to gauge the size of the box they’ll need to use to ship the order. Using the right sized box consistently instead of boxes that are too big can save your warehouse money in both shipping and material supplies. Handling Recalls: If a product is recalled, your barcode system will identify everyone who purchased the defective item. This will make it much easier for you to alert every individual who purchased the product and minimize the liability your warehouse may be exposed to. Choosing a company to handle your barcode system needs goes beyond simply finding a business that can implement a system for you. Choosing the right partner involves finding a company that appreciates how barcode technology was developed and, more importantly, where it’s headed in the future. It also involves finding a company that has the experience to provide customized solutions to fit your warehouse’s needs. Fortunately, if you’re interested in getting a barcode system for inventory control, DBK Concepts has a nearly thirty-year history of implementing and maintaining barcode systems for business of all sizes, including Fortune 100, 500 and 1000 companies. Our team of more than 200 employees includes 130+ certified technicians and 15 electrical engineers, making us one of the largest privately owned service centers for handheld mobile technology in the United States. Our team also includes in-house software developers who can create the custom-made software your warehouse needs to remain up to date with evolving barcode system technology. Even if you don’t need a barcode system, we can still help you reduce operational costs and improve your warehouse productivity with our full line of new and refurbished products. We offer tablets, handheld computers, laptops, POS terminals, interactive digital signs, vehicle-mount computers, printers and kiosks. We even offer wireless networking and storage solutions that can be customized to address your specific needs. If you do need a barcode system, working with us is the best choice you can make. We’ve partnered with some of the most trusted names in the industry to make sure you get the maximum value out of your barcoding system, including Honeywell, Fujitsu, Datalogic, Denso, Janam, Metrologic, Opticon, Intermec, Cipher Lab, Unitech and dap. We don’t stop after your system is implemented, either. We’ll continue to provide the support you need whenever you need it after your barcode system is up and running. Whether you’re looking to upgrade to a new system or you just want to make sure you’re getting the most out of your current one, we can help! Contact DBK Concepts today and enjoy the peace of mind that comes with knowing you’ve chosen the right partner for all of your technology needs.